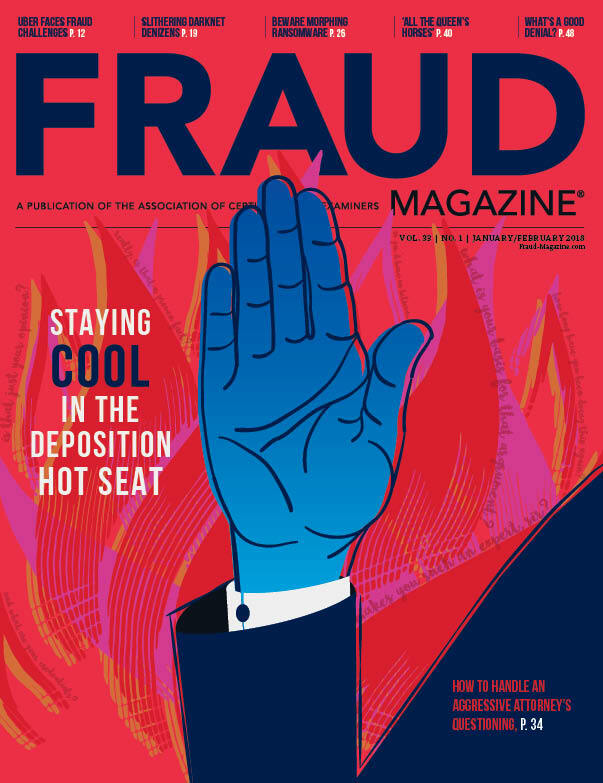 Dr. Joseph T. Wells, CFE, CPA, the author of a colorful new autobiography, writes about his fables, follies and foibles in the wild ride of a life that has culminated in the establishment of a new profession and solid anti-fraud practices. 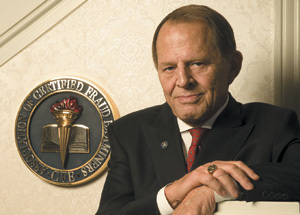 Dr. Joseph T. Wells, CFE, CPA, founder and Chairman of the ACFE, began an association and proession that endures. He is surrounded by some of the 19 books (to date) he has written or edited. Our fates turn on decisions: college majors, job selections, marriage partners. We can change our minds, but usually our directions are set early and continue as we live out our days. If Joseph T. Wells had made a few different choices, your life probably wouldn’t be the same. If he hadn’t decided to leave his hardscrabble Oklahoma life to join the Navy, then go to college, graduate and take an auditor’s job, leave the public accounting field and join the FBI, then become a private investigator and finally risk all his income and possessions to begin the ACFE, you wouldn’t be reading this article. You might not even be a fraud examiner. 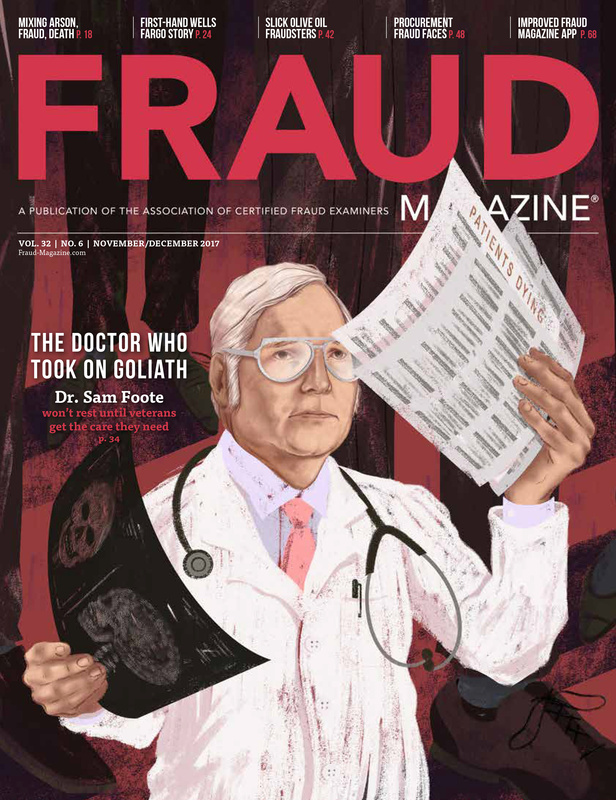 Dr. Wells, the founder and Chairman of the ACFE, writes about his decisions — good and bad — in his new autobiography, “Fraud Fighter: My Fables and Foibles,” to be published in May by John Wiley & Sons Inc. (Read a short excerpt below.) Dr. Wells will be signing his autobiography and his new Wiley book, “Financial Statement Fraud Casebook: Baking the Ledgers and Cooking the Books,” at the 22nd Annual ACFE Fraud Conference and Exhibition June 12-17 in San Diego. 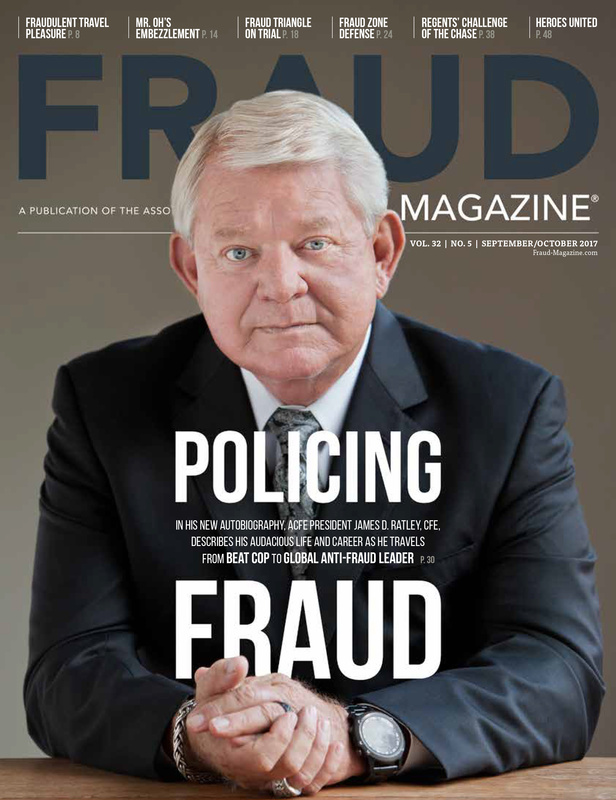 Dr. Wells’ decisions ultimately led to the founding of an association that has given anti-fraud tools and training to thousands. And he had a lot of fun doing it. We’re all, of course, the products of our genetics, backgrounds and experiences. What were some of the major factors that determined the course of your life? That is a big question. But the essence is that I came from a background where expectations were very low. All of my relatives quit school early and worked their entire lives in the oil fields. I simply wanted to have a different life and to better myself. 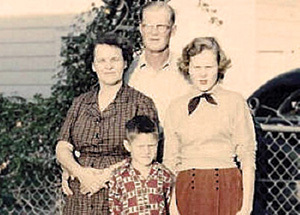 Dr. Wells (here with his immediate family) writes that his Duncan, Okla., early childhood was difficult. You write that you had a dysfunctional youth, but eventually a teacher and his family took you in during your latter high school years. How did that affect your life and career choices? I was the product of divorced parents: an alcoholic, absent father and a mother who had her own problems. My role models at the time were my own flesh and blood, and they believed that a person who set high goals was bound to fail and be disappointed. I was taken in by Bill Dean, one of my teachers, in my junior year in high school. He, his wife, Margaret, and their daughter, Tina, saw something special in me and told me I could be anything I set my mind to. That was a completely new concept. And without their love and support, I don’t honestly know how I would have turned out. What were some of the lessons from your overseas days as a Navy sailor? Until I joined the United States Navy after high school, my entire existence consisted of a small town in south central Oklahoma. But before I turned 21, I’d been halfway around the world. I learned that, in uniform, no one knew if you were rich or poor; you were judged almost entirely on your accomplishments – not your pedigree. Plus, the close confines of a ship is a great way to learn how to get along with others. If you developed enemies at sea, you’d still see them every day; there was no escape. What motivated you to attend college at age 24? Why did you eventually enroll in the University of Oklahoma College of Business? In the early 1960s, kids that went to college were the exception, not the rule. There were not the kinds of scholarships and student aid there is today. I was very fortunate that, as a veteran, I was eligible to attend college on the GI Bill. It paid for most of my education. I originally wanted to be an astronomer but had great difficulty with abstract math. So I did a complete about-face and switched majors to accounting because jobs were plentiful and starting salaries were good; it wasn’t because I was enamored with debits and credits. You said in your book that you were bored as an auditor and jumped at a chance to apply with the FBI. But how did your auditing and public accounting skills first help you when you became an investigator? Public accounting was a tremendous learning experience, although I intensely disliked auditing because it greatly limited my contact with other people. But working as a CPA taught me how to be more methodical and organized. And I learned about business and finance. All of these turned out to be indispensable skills as an FBI agent working white-collar crime cases. You write about your training at the FBI Academy in Quantico, Va. Can you talk a bit about some of your most vivid memories? Even under the best circumstances, graduating from the FBI Academy was difficult and challenging. The curriculum was roughly divided into three areas: the classroom, physical fitness and firearms. The latter was the most difficult for me personally. Before becoming an agent-trainee, I’d never fired a weapon in my life. Someone estimated that we all fired at least 10,000 practice rounds with our handguns alone, not counting rifles and automatic weapons. The sheer repetition made you a competent marksman. But everyone had to qualify with a certain minimum score to graduate. However, trainees were allowed to score their own targets, so I and everyone else participated in what I dubbed “target-scoring fraud.” I hope that system has been changed. When you transferred to the FBI’s New York office at age 30, the assistant special agent in charge (ASAC) assigned you to the bribery and political corruption squad. Later, did you muse on how that ASAC not only determined your destiny but the future of anti-fraud training? I was assigned to the bribery and political corruption squad for only one reason: there was an empty desk on that squad. It never occurred to me at the time that it would lead me to where I am today. You write about your first white-collar crime case — a young teller who had “borrowed” money from her cash drawer. What principles did you learn from that case that have stuck with you through the years? It would be easy to conclude that people, given any opportunity, will turn to dishonesty. Indeed, most internal fraud controls are developed with that thought in mind. But that simply isn’t true. Fraud is a complex tapestry of motivations. What that first case really taught me — which has been reinforced countless times — is that in the right set of circumstances, most people are capable of acting dishonestly. I say this not as a moral judgment but rather as a simple fact. In your book, you write about twice interviewing former Attorney General John Mitchell during the Watergate scandal when you were a young FBI agent. What did you learn from those unexpected encounters? Many people are too young to remember what Watergate was all about. It started out as a simple burglary to gather political intelligence in order to assist the re-election of President Richard Nixon. He was the only president in history to resign in disgrace, and that is because appointees in his administration, including Attorney General John N. Mitchell, tried to cover up that they were behind the burglary. What I really learned was that high official was a liar; he lied repeatedly to my face while under oath. It also taught me if you are caught doing something wrong, it is better in the long run to admit it and take the consequences. Lies have to be covered with more lies; it just makes the situation worse. You were 35 when the FBI transferred you to Austin, Texas, for a temporary assignment. You wrote that you felt like you had “arrived in heaven.” Even though you now live in Bellville, Texas, the hometown of your wife, Judy, why is Austin important to you? People who know me well know that music is in my very soul. There was a time when I played guitar well enough to probably earn my living at it. When I first moved to Austin in the mid-1970s, it was a music mecca. I sat in with some greats of that time: Christopher Cross, Stevie Ray Vaughan and others. I was a true paradox — fraud fighter by day, rocker by night. 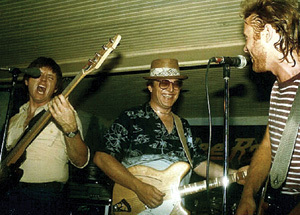 Dr. Wells, thoroughly comfortable in his adopted hometown of Austin, gets in a few licks with country-western star Lee Roy Parnell (right) and friend Bill Capshaw. In 1988, you began the ACFE on a shoestring and took great financial risks to get it off the ground. (You wrote, “If I believed in an idea strongly enough, I was willing to bet the farm.”) But it has thrived and is still growing. Why has the ACFE been so successful? If I had to put it in one word, it would be quality. From the outset, that has been our overriding goal: to be the best we can. Members see that from the detail that goes into everything, from the people who work at the ACFE to courses we develop to the name badges attendees wear. All of us have the same goal — to belong to an organization that we are truly proud of. You write that Dr. Donald Cressey, the renowned criminologist, told you that America needed a new “corporate cop” – a professional who would be the offspring of the marriage of the accountant and the investigator. How integral was Dr. Cressey’s offhand remark? Without that “offhand remark,” there might not be an Association of Certified Fraud Examiners. It took about a year for his remark to gel in my mind. The idea for the ACFE actually occurred to me after his death and in a dream. In a later conversation with Dr. Steve Albrecht before you formed the association, you write in your book that fraud examiners would be “part accountant, part lawyer, part investigator and part criminologist.” And, of course, now potential CFEs study the fraud examination common body of knowledge containing information from those four areas to earn their credentials. Why do you think that no one had devised that seminal concept even though white-collar crime had been studied for years? Good question. I guess that I’d not thought much about what it took to do this kind of work because I had done this kind of work for a long time. Steve Albrecht asked me a direct question, and I gave him a direct, simple answer. Often, good ideas just go off in your head like a light bulb. The ACFE is known not just for its seminars and conferences but its many educational products. 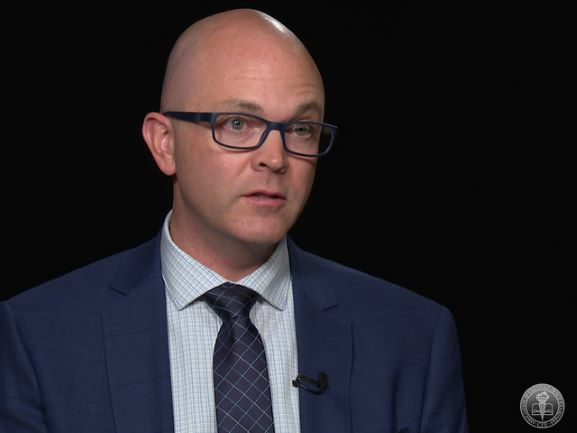 You describe in the book how you made a successful anti-fraud training video for the employees of EDS (Ross Perot’s old firm), which led to your first video, “Embezzlement: The Thieves Within,” for banks — a first for the anti-fraud field. You then made a succession of videos and workbooks. Do you think that the production of those products was pivotal for the beginning of the association? In an indirect sense. 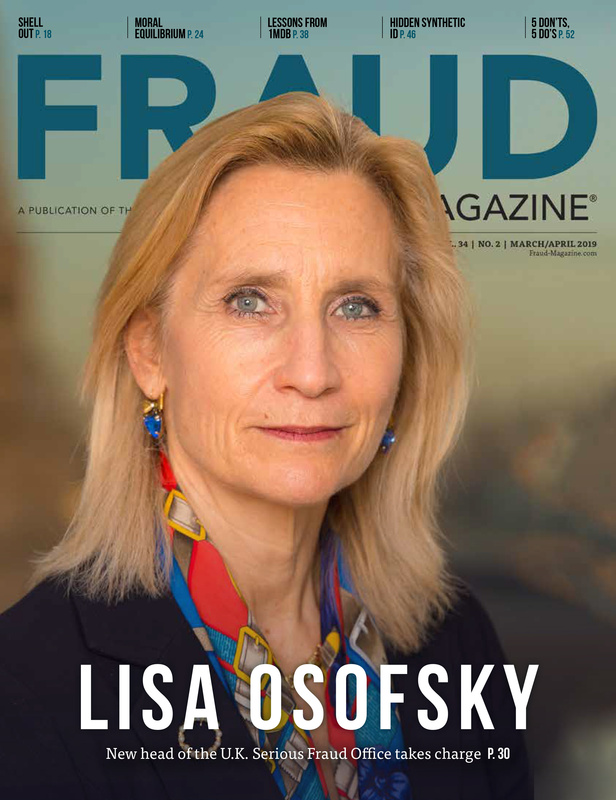 The most direct connection was that I read up on the causes of fraud as espoused by Dr. Donald R. Cressey, whom I had not met. Then I sought him to appear in that very first video. He helped me to think about fraud in a whole new way. 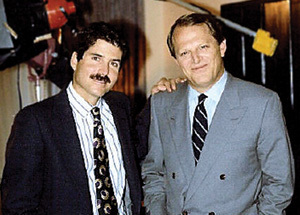 Dr. Wells has been interviewed for many national media outlets and television programs, including 20/20 with John Stossel (left), who was then with the ABC program. Fraud prevention and deterrence have been the hallmarks of the ACFE from its beginnings. In your book you write, “It made much more sense to try preventing these [fraud] problems than to deal with the mess afterward.” Why is it still so important to concentrate on these points? When it comes to crimes of any sort, there are no winners. The victim loses; the criminal loses; society loses. Much street crime is committed by individuals, primarily males, who come from violent and abusive backgrounds. These kinds of crimes are very difficult to deter. Fraudsters, on the other hand, are generally better educated and come from normally socialized environments. Moreover, fraud — unlike crimes of passion — involves a deliberate thought process. If we can educate potential offenders and potential victims, fraud is less likely to occur. You write about numerous cases you’ve worked on through the years. Are there one or two cases memorable for the sheer audacity of the fraudsters or because of what you learned? One of my most memorable cases takes up a whole chapter in the book. It is about William G. Burgin Jr., a powerful state senator from Mississippi. There were many twists and turns, but he was ultimately convicted of taking bribes to award state contracts and spent three years in prison. I was told that Burgin was too smart to get caught. But the bribes were taken in the form of checks. Those were deposited to his own bank account in his own true name. How’s that for smart? You’ve been involved with investigations most of your life. What’s fun about the chase? Do you enjoy matching your wits against those of the criminal? 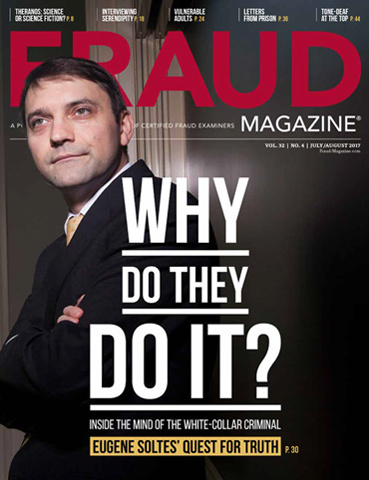 White-collar crime cases, including fraud, are not normally whodunits.The identity of the suspect is known almost from the start of the investigation. What is involved is to determine if the alleged conduct is a violation of the law. If so, then it becomes a process of methodically gathering the evidence from documents and witnesses. Someone once asked me, “What would a ‘smart’ white-collar criminal do?” I replied that I’d never met a “smart” one. If they are that smart, they wouldn’t come to my attention in the first place. You write in your book that the “Fraud Tree,” derived from the ACFE’s original “Report to the Nation on Occupational Fraud and Abuse – The Wells Report,” was the first schematic of all possible frauds. How has the Fraud Tree (and “The Wells Report”) affected fraud research and the understanding of fraud concepts? Without overstating it, the “Fraud Tree” has revolutionized the study of fraud. Most people who don’t investigate fraud for a living think that there are an unlimited number of ways to commit occupational fraud. But I’d seen the same schemes over and over again, so I knew that wasn’t true. By examining more than 2,000 actual cases, we saw every fraud and every variation. They can be broken down into three main categories with 11 sub-schemes. The ACFE produces “The Report to the Nations” every two years. [The report now covers global fraud — hence “Nations.” – ed.] There are no new frauds; just the frequency and losses vary. If a person is responsible for investigating or preventing occupational fraud, knowledge of these schemes and their earmarks is absolutely vital. It can be said that before you no one had ventured to meld the academic and practical sides of fraud examination. Why is it so important that the ACFE continue its quest for deeper research? 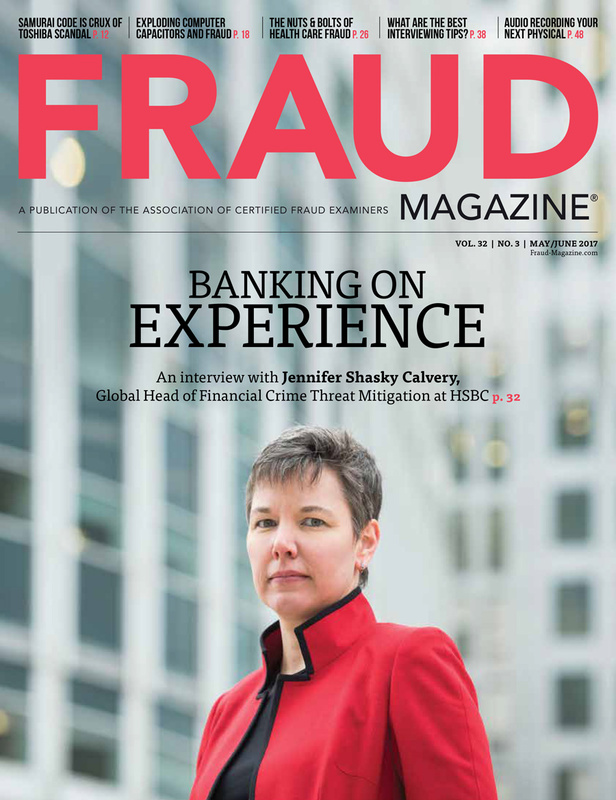 When it comes to knowledge of the root causes of fraud, we’ve not even scratched the surface. In the academic world, criminologists have traditionally conducted their research on violent and street crime because that is where the grant money has been. In the accounting world, CPA firms have nearly always concentrated on detecting fraud to avoid liability. To gain some perspective, get 100 people in a room and ask them two questions. “How many of you have been a victim of robbery, assault or burglary?” Perhaps one hand will go up. Then ask, “How many of you have been ripped off?” Everybody has. That’s why fraud research is so important; fraud affects every single one of us. For many years, you taught a popular fraud examination course at the University of Texas – Austin, which you probably couldn’t have imagined when you first formed the association. Can you talk a bit about your early days as an instructor for the ACFE? Do you have future plans for university teaching? There is no telling how many courses and speeches I’ve given for the ACFE. It has to be thousands, many in remote corners of the world. The University of Texas – Austin asked me to develop and teach a course in fraud examination, which I was happy to do. I taught it for five years before handing the baton to someone else. I am 66 years old and road-weary; I’ve got more than two million frequent-flyer miles. Other than speaking at the occasional course for the ACFE in Austin, I limit my travel to our Annual Fraud Conference, where I am honored to meet our members in person. In 2002, you began the ACFE’s Higher Education Initiative, in which the ACFE would supply teaching materials at no cost to accounting professors for fraud examination courses. That program has been hugely successful, with more than a third of U.S. colleges participating. How do you think the ACFE’s education promotion ultimately will affect the state of fraud examination? When I majored in accounting, my anti-fraud training could have fit in a thimble with room left over for my finger. That was absurd; the public has always looked to the accounting community to detect and deter fraud. When we started the Higher Education Initiative, there were only 19 colleges out of 900 teaching a fraud course. Now it is approaching 400. We won’t rest until all of them are in the boat. In your book, you write that you’ve “always been an adrenaline junkie. That probably was a major factor in my joining the FBI —I just don’t like things too safe.” Where do you think that character trait came from? I’ll need to leave it to psychologists and others to determine where my character traits — good and bad — came from. To me, they have come from living life. Perhaps a person is born with a sense of adventure; I don’t know. I only know that I’ve always had it. What advice and encouragement can you give budding fraud examiners? Because investigating fraud sounds exciting, there are many who are interested but have no experience. The key is paying your dues. Becoming a CFE is a big part of that. However, there is simply no substitute for the hands-on knowledge gained by working in the profession. Another part is being honest with yourself about your personality characteristics. By its nature, fraud examination is an adversarial process; you are trying to prove someone did something wrong. That eventually means confrontation, either in or out of the courtroom or both. If that makes you uncomfortable, choose another line of work. But for those experienced and well-suited, it is a job that brings enormous satisfaction. You are helping make the world a better place. What advice can you give those who want to make a break and hang out their fraud examination business shingle? Nearly all professional work — doctors, lawyers, dentists, architects, fraud examiners — comes from referrals. Although opportunities abound, most professionals who fail to make it underestimate the time it takes to build a strong network of clients. So my advice is that, if you are serious about hanging your shingle, have enough financial resources to last at least a couple of years until your business takes hold. Dr. Wells began a profession that endures. This book was quite an undertaking. Had you been thinking of writing an autobiography for a while? How long did it take to write it? What eventually spurred you to finish it? What were your motivations for writing it? Wiley, my publisher, had been prodding me to do this for at least three years. When I finally decided to write it, I was determined that it would not be a white-wash. That meant thinking of things I’d rather forget and admitting to mistakes that I’d rather not remember. I’m not inexperienced in writing, but this is the most gut-wrenching thing I’ve ever done. In a way, though, it was cathartic. From the time I first started the manuscript, it took about 15 months of writing an hour or two most days. Had you kept notes through the years, or did you write your autobiography from memory? Did you receive advice on how to construct and write it? No, yes and no. I did not keep notes; it is all from memory. And I received no advice on how to construct or write it. Somewhere during the process, I decided that the book would not be written in strict chronological order. At first, I was unsure whether that was the right approach, but others who have reviewed the manuscript think it is more interesting this way. You write openly about your addictions, primarily to alcohol. Why did you disclose that? Because it was an important aspect of my life. I came from a long line of addicts, so I inherited the trait honestly. But it was only after I’d achieved significant success that the problem became worse. I don’t drink anymore and have no desire to. I don’t miss alcohol at all; I’ve been liberated from it. Maybe this book will help other addicts. What other writing plans do you have? You’ve mentioned a possible fiction book. What kind of genre? Hemingway used to say that he was satisfied with one good paragraph a day. But, of course, his books were pretty skinny. I love to write, period, and I put out a couple of pages a day, on average, of nonfiction. Currently I am taking an online novel-writing course. It is a completely different style than I am accustomed to. I don’t have a specific novel in mind, but it might be something fun to do; we’ll see. You don’t have a crystal ball, but can you see areas in which fraud will be more prevalent, say, in the next 10 years? There is little question in my mind that we are only seeing the tip of the iceberg in trans-national frauds — those originating in a country or countries with principle victims in other nations. That is because crooks have figured out that international law enforcement is complicated and easy to evade. This problem has its origins in the connectivity of computers worldwide. There is no current, easy fix. What we’ve seen in the last 30 years is that frauds, in general, have gotten larger. That is especially true with financial statement frauds and investment swindles. My idea for a fix in this area is somewhat counterintuitive and requires a bit of explanation. Complexity is the killing field of fraud; the more complex a transaction, the easier it is to mask misdeeds. Enron was a classic example. We need to greatly simplify the financial reporting process. Annual reports are now so complicated that even CPAs like me can’t understand them. Finally, one thing that hasn’t been written about much is the demographics of fraud. It is a crime of the older, more-educated person. Our population will continue to age until about 2050 before the trend reverses. Until then, despite our best efforts, we should expect to see fraud continue to rise. But if we did nothing, the problem would get even worse. You thank many people in your book for their contributions not only to your life but to the formation of the ACFE. Of course, we can’t mention all of those people here, but who are some of those key people you’d like to acknowledge? First would be my wife Judy, who has stood by my side cheering me on for 28 years. Then Jim Ratley and Kathie Green Lawrence. Although I had the idea, they made it work and dedicated their lives to it. Kathie retired at the beginning of 2009; Jim is now President and CEO. I couldn’t have done it without them, especially Jim. My assistant, Jeanette LeVie, has kept me on the straight and narrow for more than 20 years, and she deserves some sort of medal for that. There have been thousands of volunteers at the chapter and headquarters level. They have my undying gratitude. And then there are the people who do the real work: the staff at the ACFE. The ACFE has grown considerably since 1988. What do you see for its future in 10, 15, 20 years? Ironically, I think that one of the reasons the ACFE has succeeded is that our definition of success is not numbers; it is in trying to do the best job we can. And what we failed to recognize at first is how important that concept is to other people. Members are truly proud to belong to the ACFE; I certainly am. What we’ve understood from the outset is that if everyone can be a CFE, then no one will want to be. As long as we keep our high standards, this association will find its own level; it will always be here. Our main future goal is to ensure that the ACFE continues to develop as a truly international organization. We have a great start because more than 25 percent of our members are from non-U.S. countries. But it is a big world out there, and our members are determined to have an impact in it. No one but you has established (though many have tried) an association such as the ACFE. What do you hope your legacy will be? Without any false modesty, I’d just like to be recognized as trying to be a good man, a good friend and a good husband. 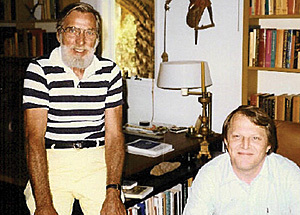 Dr. Joseph T. Wells, CFE, CPA (right), visits Dr. Donald Cressey for the first time in Cressey’s California home. When I was working fraud investigations for Wells & Associates, I found corporations’ naiveté especially disheartening. Frequently, with major frauds right under their noses, corporate management would ignore all signs of them. To me, it made much more sense to try preventing these problems than to deal with the messes afterward. I decided to learn as much as I could about the root causes of fraud, especially in the workplace. 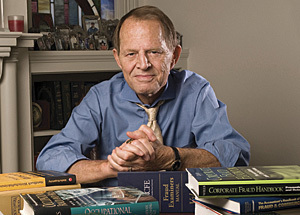 My search began at the vast libraries at the University of Texas – Austin, which had exactly three books on fraud. I checked them out and read each carefully. One made sense — a rather thin book, titled “Other People’s Money: Study in the Social Psychology of Embezzlement,” written in the early 1950s by Donald R. Cressey. First, each had an unsharable need — such as excessive debt, gambling or addiction problems, or other difficulties — that made their situations personally embarrassing. Second, each had a perceived opportunity to solve this unsharable need by violating their employers’ trust in them. Third, they had the ability to rationalize their acts by diffusing the criminal nature of what they were doing — such as “borrowing” the money from the company — or by blaming their acts on, for example, inadequate pay. Cressey’s model immediately struck a chord with me. I’d seen this kind of behavior countless times, starting in El Paso with my very first FBI fraud case. On a whim, I decided to see if Cressey was still alive and, if he was, to establish contact with him. After making a couple of calls, I found he was chairman of the Department of Sociology at the University of California – Santa Barbara. He was in the phone book so I telephoned him, right out of the blue. Thus began our close friendship and collaboration, which lasted until his untimely death in 1987. During the years I knew Dr. Cressey, his unparalleled influence on me shaped my personal philosophy. Shortly after we talked by phone, I visited California and met him in person. He invited me to his lovely home, which he’d occupied since the early 1960s, and I met his charming wife, Elaine. Later, he visited my home. Don and Elaine traveled to Austin frequently, and Judy and I delighted in their visits. “What do you mean, Don?” I asked. Or, as I have joked many times, we need to marry the accountant and the investigator, no matter how hideous the offspring of such a marriage might be. The significance of what Dr. Cressey said in that rather offhand remark didn’t sink in until after his death, which occurred about a year later. He and Elaine were out for a Sunday drive; she was at the wheel. Don slumped over without warning, felled by a fatal heart attack. A reformed heavy smoker, Donald Ray Cressey was dead at age 67. Before he left this world, though, Don’s penetrating insight and generous spirit had planted a seed deep within my mind. Not long afterward, it grew into a practical concept that transformed fraud detection and prevention. The idea of the Association of Certified Fraud Examiners (ACFE) probably came to me in a dream spurred by Don’s observation. I went into the office one early summer morning in 1988. Jim Ratley [who is now the ACFE’s President and CEO] and I sat on the front porch, and I shared with him Don’s offhand comment. During the ACFE’s 22nd Annual Fraud Conference and Exhibition, the 2011 Cliff Robertson Sentinel Award went to William H. McMasters, the Boston publicist who, in 1920, helped take down the most notorious pyramid schemer of them all: Charles Ponzi. I attended the Principles of Fraud Examination in Austin a few years ago to see if this was an area I wanted to move into. One evenng while waiting to catch a shuttle ride to the ACFE headquarters for a social gathering, Dr. Wells offered to drive me over personally in his beautiful red Jaguar. Of course I jumped at the offer. He truly is an amazing individual that I know we all could learn so much from. I look forward to reading his new book and many of his others. I hope to make it to an annual conference one of these years. DR. Wells, I am looking forward to have your book. I would like to assert the fact that your insights, books, and all what the ACFE does have changed my professional career from being a successful CPA to a one who is dedicated to fight fraud in a different part of the world; the Middle East. Your story that started in 1988 with the ACFE constitutes a real driving force for our efforts to fight fraud professionally and methodically. Simply, I am proud to be a member of the ACFE where I am sure that what we do has a great impact on each aspect of not only the society we live in, but also on the globe.